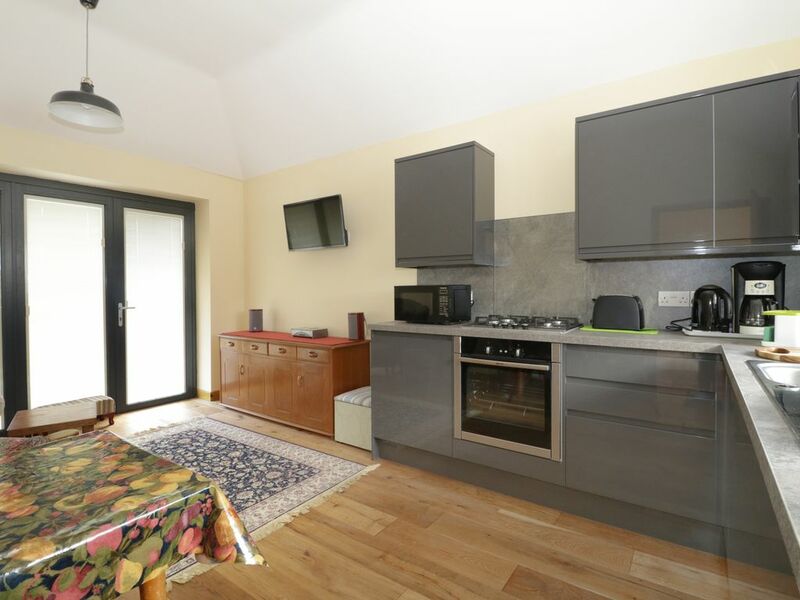 This annexe is situated in the village of Sturminster Newton, near Blandford Forum, and can sleep two people in one bedroom. 1 White Lane Close is a one bedroom annexe situated in the village of Sturminster Newton, Dorset. Hosting one double bedroom, and a wet room, this property can sleep up to two people. Inside you will also find an open-plan sitting, kitchen and dining area. To the outside is off-road parking and an outdoor patio area with furniture. Resting in a charming location with places of interest just waiting to be explored, 1 White Lane Close is a delightful retreat in a unique part of England. Amenities: Gas central heating. Electric oven and gas hob, microwave, fridge with freezer compartment, washing machine. TV with Freeview, DVD, WiFi, selection of books and games. Fuel and power inc. in rent. Bed linen and towels inc. in rent. Off-road parking for 1 car. Outdoor patio and lawned area with furniture. Sorry, no pets and no smoking. Shop and pub 1 mile. Note: No children allowed at property. Note: Selection of mobility accessories available if required. Note: Small step into shower room. Note: WiFi is intermittent. Note: property is 5 miles and 15 minutes from Todber Manor Fisheries. Region: Explore the fossils and stunning beaches of Dorset’s Jurassic Coast, visit historic Sherborne and Shaftesbury, or enjoy the footpaths, country lanes and thatched-roof pubs Dorset offers. Town: Set on the banks of the River Stour and reached via a graceful, six arch 15th Century bridge. the small market town of Sturminster Newton is a fascinating holiday destination. The surrounding area was apparently a source of inspiration for the works of Thomas Hardy, most famous for his novel 'Tess of the D'Urbervilles' who supposedly wrote 'Return of The Native', whilst living in the town. The region is dotted with thatched cottages, rural walks, stunning country views, and towns. Gas central heating. Electric oven and gas hob, microwave, fridge with freezer compartment, washing machine. TV with Freeview, DVD, WiFi, selection of books and games. Fuel and power inc. in rent. Bed linen and towels inc. in rent. Off-road parking for 1 car. Outdoor patio and lawned area with furniture. Sorry, no pets and no smoking. Shop and pub 1 mile. Note: No children allowed at property. Note: Selection of mobility accessories available if required. Note: Small step into shower room. Note: WiFi is intermittent. Note: property is 5 miles and 15 minutes from Todber Manor Fisheries.